Rainy April? Doesn’t Feel Like It! Looks like today is day #24 of measurable rain this month in Portland. While making a graphic for that I thought “it doesn’t seem like it’s rained that many days!”. So I did some checking between shows tonight. Our total rainfall is slightly above average, and will end that way tomorrow. I see Salem and Seattle are more noticeably above average. The record wettest Aprils are in the 4-5.25″ range here in Portland though…how did THOSE months not have more days of rainfall? How is this nearly average rainfall month going to either tie or break a record for days of rain? Well, we’ve had lots of light rainfall days…no long-lived (3-5 day) ridges of high pressure, and a wet period to start and end the month. Apparently everything worked out right to get lots of light rainfall days. Now notice I said “days”…that’s not really correct…and it goes with my thoughts about the month not “seeming” so wet. Sure enough, we had a mainly dry two week period in the middle of the month where the only significant rainfall fell in the overnight hours twice. On the 12th and 14th, more than a tenth of an inch fell both times, but during the dark hours of the day. That means we went 17 days in the middle of the month with no significant daytime rainfall (9th through the 25th)! That might explain why I’ve heard very few complaints about a “rainy April” and why to this long-time Pacific Northwest resident it seems like a very typical April. I do notice we’ve only hit 73 so far this year…seems a bit strange that we haven’t hit 77 or 82 or something along those lines at least once. That would go with the lack of decent upper-level ridging over the region. The weekend looks slightly wet to start Saturday and then much better later Saturday and Sunday. The ECMWF is still very cool and showery Monday while the GFS seems to be out in it’s own little world…unsure how strong ridging will be over us the beginning of next week. We are now within the 84 hour forecast of the NAM (Monday) and it totally agrees with the big cold trough of the ECMWF. Can’t wait for that GFS upgrade in June! 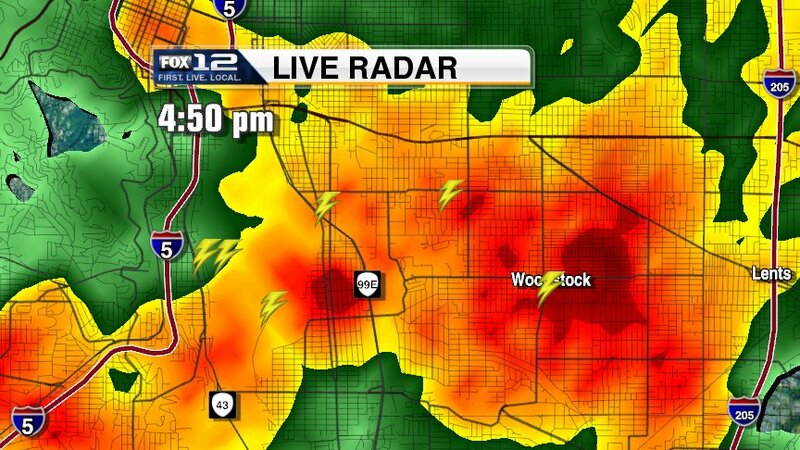 Nice thunderstorm moved through the SE part of Portland between 4:45 and 5:15pm. Big downpour, hail, and 7 cloud to ground lightning strikes. You can click on the picture to get a closer view. 10pm Update: And now it’s time for the update. Good times today with all the active convection. That storm spit out all the lightning strikes and then promptly shut down. The showers were just flying today…15-20 mph. That means we quickly moved from rain to hail to sunshine. Someone at the coffee shop told me she just loves this type of Spring weather instead of the long, gray, gloomy days…I agree. Tomorrow looks a bit quieter with shallower convection and a more stable atmosphere. It seems to shut down quickly after 5pm too according to mesoscale models. Friday should be dry with showers confined to the hills (upslope areas). The forecast issues are Saturday and beyond. Looks like warm advection and a weak system moving right over the top of a building ridge will be strong enough to spoil our Saturday morning…probably drippy, especially in the upslope areas. The Corbett community is turning out for a day of service to work on the schools and school grounds (mainly outdoor work). I’ll be participating in that and unfortunately I think it’ll be wet! The weather should improve Saturday afternoon and all models point to much better weather on Sunday. The big disagreement is still beyond Sunday. The ECMWF was still going “basketballs to the wall” with a cold trough moving right down into the Pacific Northwest in the 12z run. The 00z run comes out in an hour or so. The 00z GFS has come slightly towards the ECMWF, showing another system brushing us Monday morning on it’s way southeast. Not any cold air with it in that case. We’ve decided to go with the most consistent ECMWF, thus the cool and wet forecast starting Monday. The annoying thing is that the GFS has been almost as consistent showing general ridging over us Sunday through Wednesday. But with the 00z chinks in the armor of the GFS (Monday showers), I feel better now about staying with the ECMWF. Glad I got everything done outside…now I can come back to work and relax. Got my cool-weather veggies planted, and spread out about 1/2 of the Zoo-Doo pile. The pile of tropical animal poop Saturday morning before I started working on it. The rest is to split with a friend. I guess I could adapt Stephanie’s “you can take a girl out of Gresham…” saying to “you can take a boy off the farm but you can’t take the farm out of the boy”. Up until about 8th grade I was sure I wanted to be a farmer, then the weather bug bit me and I moved on. But all those chores are taken care of…good news since the rain is really coming down now. Radar screen is solid with rain all over Western Oregon and Washington. A surprise this afternoon was some mixing down of stronger wind ahead of the approaching cold front. Seems to have only occurred on the east side of the Valley and Cascade foothills from about Estacada down to Springfield/Eugene. I see Stayton RAWS had a gust to 44 mph…impressive for the end of April. The wind has died down now. 10pm Update: I see McMinnville is already well past 1/2 inch of rain already…front has been very slow to move east as a wave moves north offshore. Much lighter amounts so far on the east side of the Valley. I wouldn’t be surprised if we see widespread .50-.75″ totals out of the front itself. Then it’s on to three days of chilly showers and sunbreaks weather tomorrow through Thursday. I’m not too impressed with the chance for thunderstorms in this pattern, although it’s hard to believe with such a chilly airmass we won’t see at least hail showers the next few afternoons. I DO notice quite an orographic effect…check out the WRF-GFS for the next few days. It shows very little rainfall on the west side of the Metro area (once we get into the scattered showers tomorrow), and almost constantly wet conditions on the foothills of the Cascades and in the mountains themselves. Still a huge difference in the GFS and ECMWF for Saturday and beyond, although things seem to be coming a bit closer together this evening. The GFS built a big ridge in the east Pacific and then flopped it over us starting on Sunday. The ECMWF through 12z this morning showed a vigorous and cold trough dropping in, smashing right through the ridge Sunday and beyond…totally different solutions. I see the GFS is definitely showing some retrograde action the last few runs, so apparently today was a good day to back off that crazy forecast of 70+ starting Sunday. Charles Dalton posted this note earlier today in the comments, but I think it deserves it’s own post! Farewell everybody. I am moving on from this great town of Portland…back to the land of thunderstorms. I’ve been here at the NWS in Portland for 4yrs this month. My time has finally come to move on however, and I now make the trek back east to Arkansas. I will be the newest general forecaster at the Little Rock office. I have enjoyed watching this blog over the past 4yrs. This blog has been a valuable resource at times…especially during winter weather when you all report temps and precip from about the area. Furthermore, it has been interesting to see you grow in your knowledge about the weather. You’ve gone from knowing essentially nothing about the workings of weather and forecasting, to having a decent grasp on things. I encourage you to keep enjoying and learning about the weather. Keep up the weather watching! Well that’s too bad…I think most of you would agree that Charles has been a great forecaster over at the NWS. He clearly loves forecasting and watching weather. Very supportive of our “virtual weather-geek pub” right here as well. And each time a new forecaster comes to town (whether it’s NWS or TV) he/she needs to learn all about our little issues (rain shadows, gorge effects, inversions etc…). Well, we know next winter when the east wind is raging out of the Gorge and moisture is approaching from the west, Charlies will be sneaking a peek at a few PDX and TTD obs. just for old time’s sake. Maybe even checking out that -15.5 millibar PDX-DLS gradient! And, technically, he’ll ALWAYS be east of I-205 now! Good luck Chuck! Looks like Sunday will be the last warm and dry day for awhile. All the models agreeing on troughing in the western USA all next week. Of course the big disappointment, already noted in the comments earlier, is the change in the Monday forecast. Instead of the approaching system splitting and heading for California (delaying the onset of rainfall), it’s coming right on in by Monday afternoon at the latest. The screaming message is to get your dry weather projects done by early Monday…or over the weekend. 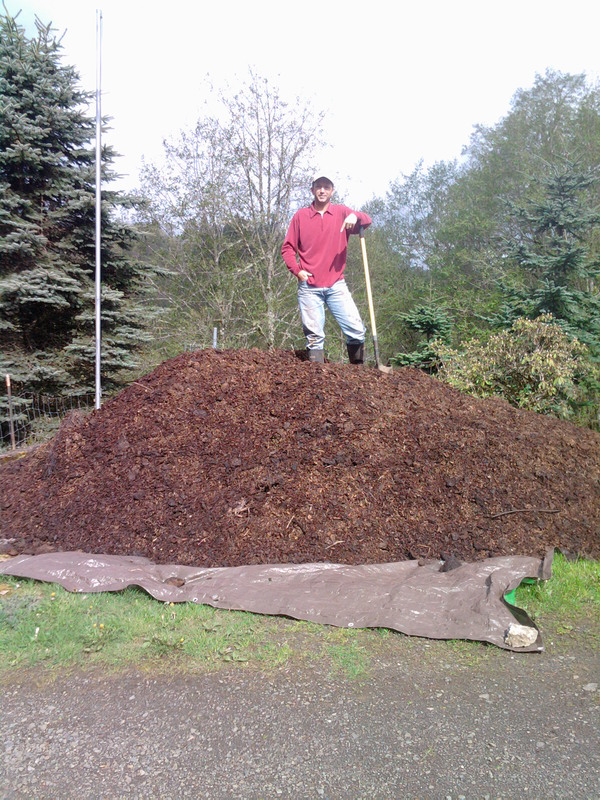 I just got my big load of Zoo-Doo delivered today…12 square yards of beautiful, steaming, composted elephant, giraffe, and rhinocerous poop. The zoo donates it to various causes; I picked up mine at an auction. I hear it’s good stuff…in fact my dog was eating it within about 2 minutes. Another reason not to have a dog in the future once this guy finishes out his happy life capped off by the steaming pile of dung. Alright…time is running out on this Friday evening. I’ll be on Sunday night, so if I get a minute I’ll post some thoughts on next week’s weather then. My son Andrew is hanging out in the weather center late this afternoon. Stephanie snapped a picture of him enjoying her generous gift of chips and sour patches. He’s been asking for months to come to work with Dad on the official Take Your Child to Work Day. This is fun for the kids since they get out of a bit of school. In Andrew’s case he only missed a bit since Dad doesn’t start work until the end of his school day. But on the positive side, what could be more fun than talking about vorticity maximums and 850 millibar temperatures this weekend with the old man??? He’s already had an exciting half hour at physical therapy (shoulder issue), on to Freddies, Starbucks, and then to work. Evening sandwich shop and Krispy Kreme are on the schedule for later. And of course the large monitors in the back of the weather center will become “Wii Central” after 6pm. Obviously I’m not going to get much done today…luckily the weather doesn’t look real significant the next few days. Depending on the strength of the ridge and atmosphere overhead, I think we have a chance at hitting 75 Monday. For sure it’ll be right around 70 or just above Sunday and Monday. The rest of next week should be cool and showery at times with troughiness nearby. Steve Pierce sent this to me just a few minutes ago. 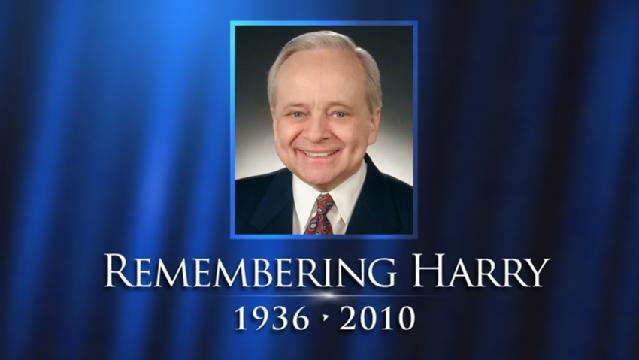 Longtime KIRO-TV weathercaster Harry Wappler died last night. Those of you in most of the Portland television market have probably never heard of him…but think of him as “Seattle’s Jim Bosley”. And I think some of you in Clark and Cowlitz counties may receive KIRO’s signal via cable. I spent the last 7 years of my life before Portland growing up in Chehalis, so I was able to watch all the Portland stations AND all the Seattle stations all through the 1980s. He’s a legend up there, maybe not for being the ace weather geek, but for his comfortable, friendly delivery on television. He was exactly the same in person. My first introduction to the television weather world was at KIRO-TV in the winter of 1990-1991. I did a 3 month internship there while attending the UW. I worked with Larry Rice and Nick Walker (he was only the lowly weekend weatherguy then!). It was an exciting time…a TV station with weather maps and cool weather graphics that you could create on a computer!!! For my internship “final” I interviewed Harry and wrote a paper about it. He was a very nice guy who was willing to sit down for 20 minutes and talk to a college kid he had never met. I always interned on weekends and mornings; he worked evenings. People like that always impress on me how important it is to slow down, take the time, and help others out when you can. And no matter what your position in life, how much money you make, or how much power you hold, you’re no different than everyone else. Okay that’s a little deep, but I just got the feeling that’s how he operated up there. Rest in peace Harry! You are currently browsing the FOX 12 Weather Blog blog archives for April, 2010.